New Bullet Hole Will Feature Variety of Improvements … Including (Perhaps) a New Name | The Gettysburgian. 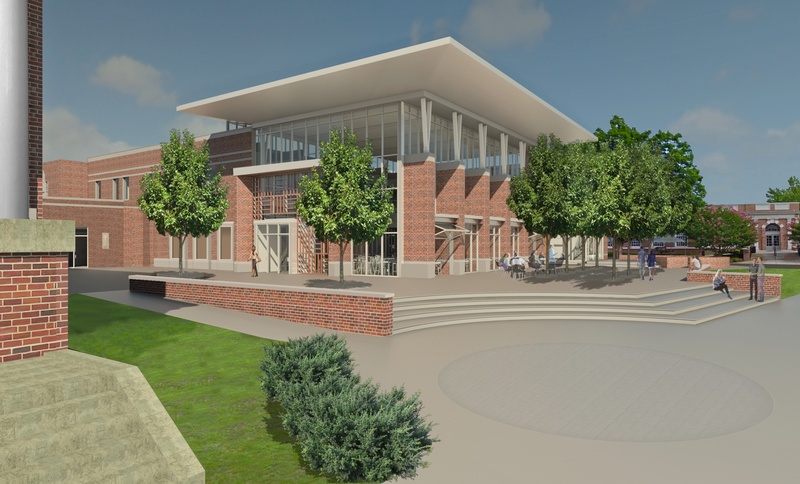 With renovations to the College Union Building (CUB) well underway, Gettysburg College Dining Services is working to reimagine just about everything about how its new spaces will serve the campus community. Beginning next fall, the Bullet Hole will relocate back to the CUB, Commons will move to a new space within the CUB, and the temporary Bullet Hole location will become known as “The Atrium” and will serve as a dining space geared towards faculty, staff, and administrators during the day and small banquet facility in the evening similar to the current operation of Specialty Dining. In a wide-ranging interview with College Union Food Service Manager Mike Bishop, The Gettysburgian received extensive, exclusive insight into Dining Service’s plans. The new Bullet Hole space — including the serving area, kitchen, and seating area — will be three times the size of the old venue, which transforms the service it will be able to offer. In terms of seating, an outdoor patio space will have seating for 100, while ample seating will also exist inside a large two-story atrium that will absorb natural light. Another development will be allowing pre-orders via an online system that will be tied to student meal plans and aim to reduce waiting times during peak service periods; a common complaint of the current dining options is the existence of long lines around common mealtimes, something of which Bishop is aware and is eager to ameliorate. A variety of new menu options will also be available. Beyond the current fare available at the Bullet Hole, all of which will remain available, the new facility will acknowledge the surging popularity of “fast casual” dining and model its offerings accordingly. Because the new facility has triple the floorspace of the old Bullet Hole, Bishop sees many opportunities to expand service. “We have more options because we have more space,” he said. The salad bar concept that originated at Ike’s will be improved in the new facility with more toppings as well as specialty salads, the sub/sandwich line will introduce more breads and ingredients, and the grill/hot line will be bigger and strive for what Bishop called an “international flair” by serving rice bowls and Asian noodles, for example. Furthermore, several new stations will be introduced. Similar to Kazue, the Ramen and Sushi Bar located within the Majestic Theater, the new sushi station will also have some noodles. Pasta will be available everyday with a choice of sauce and a rotation of toppings such as chicken parmesan, meatballs, and roasted vegetables in an Italian-themed area that will also serve pizza. Bishop also foresees a custom parfait station as well as new breakfast options; the new space is equipped to serve pancakes, french toast, and omelets to order — Dining Services will gauge demand before determining what will be available at breakfast. A variety of beverages that expands upon the current options and may include more convenience store-style refrigerators such as those currently in Commons will also be available. 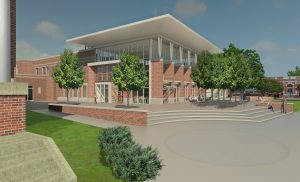 Additionally, Bishop envisions special menus to correspond to entertainment and programming in the new Junction space that will be spearheaded by the Campus Activities Board and the Office of Student Activities & Greek Life. Construction remains on target for completion next fall. Steel was delivered on Wednesday that will be used in the construction of the roof, which is expected to be complete by the end of January. From there, construction should proceed fairly quickly such that the facility can open as planned. Bishop anticipates being able to move into the new space by August 1 so his staff can work out kinks during practice runs before classes resume. In addition to the new Bullet Hole space, Commons is also getting a facelift. Its space in the renovated CUB is about twice its current size, Bishop said. As such, there will be room to include more “grocery type items” such as cereal, macaroni and cheese, and other microwavable foods that students can prepare in their rooms, a prospect that appeals to Alaina Keller ’19. Bishop hopes that the new facilities will not only better serve the current campus community, but also serve as a draw to visitors. Furthermore, he anticipates that the improvements will help ease some of the congestion that currently exists at Servo, which he admitted is over capacity particularly in terms of seating. “We expect that the new points of service will take some customers out of the dining hall,” he said. 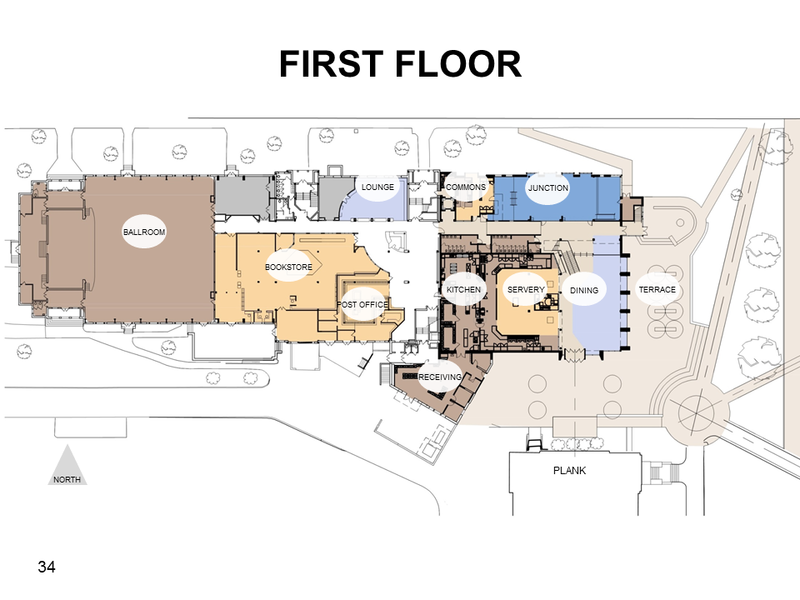 The Servo U.S.A. plan, which all first-year students are required to hold and gives unlimited access to Servo only plus 50 dining dollars each semester, will remain as is; thus, the new spaces will cater largely to upperclass students, faculty, administrators, and staff. After the Bullet Hole leaves its temporary space and what was previously Specialty Dining moves in, the old Specialty Dining location will eventually become part of Servo as part of a later phase of renovations. 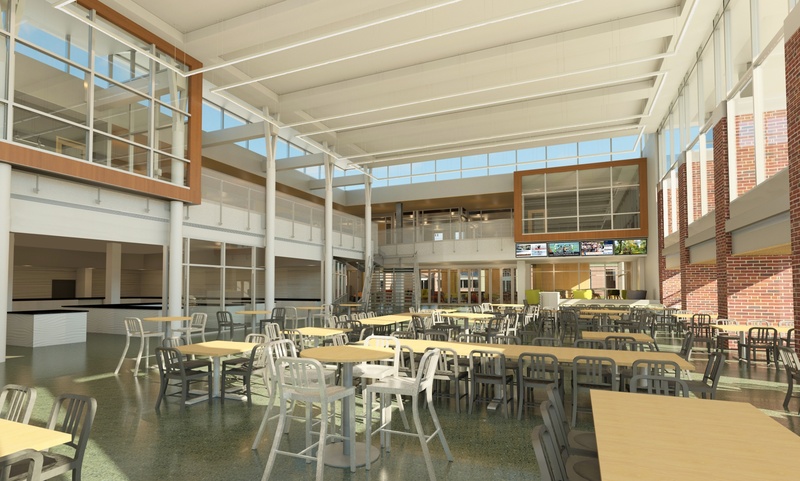 “The Atrium,” which will be available at lunchtime and will be geared towards serving faculty, staff, and administrators, will resume having a buffet with servers, just as the old Specialty Dining did. Seating capacity will increase to 160 in the new location from 120 in its prior location. All of the changes, Bishop said, are designed to better serve students and the campus community at large. As part of the move, college administrators thought it would be a good time to consider changing the name of the Bullet Hole. “If we’re going to do it, this would be the time,” said Mike Bishop, College Union Food Service Manager. Students will receive information on how to vote in an email within the next week or two, Bishop says. Bishop said that in the late 1990s, Dining Services briefly rebranded the Bullet Hole as Cafe 101, but, because students continued to call it the Bullet Hole, they went back to that name in short order. Ultimately, college administrators will have the final say on the facility’s new name, but Bishop promises that students have a large role to play in informing that decision. Editor-in-chief Jamie Welch contributed to this report.